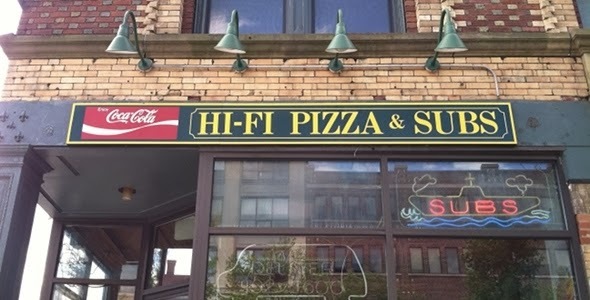 I mean, we haven't eaten here in over 12 years, we make gross-face whenever someone reminisces about eating here and actually told a member of Diarrhea Planet we'd recommend Cinderella's for pizza while sitting in here, but it saddens us to find out Hi-Fi Pizza in Central Square has closed. Wicked Local Cambridge reports that after 40 years of rusty trusty service, the go to late night drunk punk pizza place across from The Middle East / TT's has shuttered its door. A lot of obvious shady details surround the closure but Property Manager Michael Simon of Central Property Management LLC, which owns 492 Massachusetts Ave., told the publication "the restaurant’s mechanics were not up to code and it would simply be too expensive to try to keep a restaurant in that location." Shock and awe...shock...and...awe. Read on for the full story. On a separate note, Cinderella's sells Toscanini ice cream. I've eaten there many times while intoxicated. Good times with crappy food. The Hi-Fi in Dorchester was even more interesting drunk!